Previously known as Estate Management Practice, the fourth edition of this work has been renamed to reflect current market practice and to embrace the discipline of corporate real estate. This book provides a comprehensive study of the management of urban property and is divided into three parts. Part one considers the diverse nature of the many types of estates and different aspects and interpretations of the management task. Part two concentrates on the management of leased property, repairs, service charges and rent reviews and the statutory framework within which the landlord and tenant relationship has developed. Part three is concerned with the positive management covering both technical skills, such as portfolio performance, and the professional practice environment in which they are exercised. 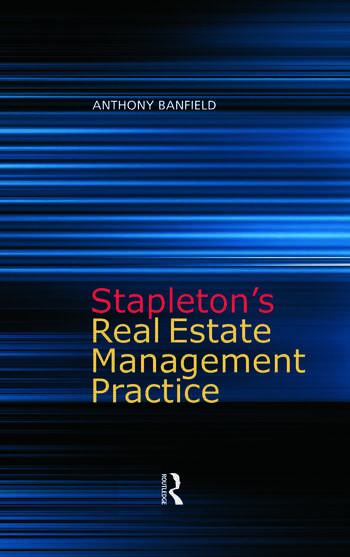 Stapleton’s Real Estate Management Practice is written both for advanced students and practitioners. It provides a firm basis for management affecting the decision-making hierarchy from tenant to property, to portfolio, to proprietary unit. While retaining the format of previous editions, it has been updated to reflect the many changes in the law, practice, technology and the market place since the previous edition. In addition, this new edition highlights factors that influence the enhancement of different types of property and the various strategies involved in managing properties from both owners’ and occupiers’ point of view. Anthony Banfield trained with the District Valuer's Office and, since qualifying in 1973, has worked in local government, private practice and for a property company. Whilst with the latter, he gained considerable experience of rent reviews as well as the management and refurbishment of a large covered shopping centre before being actively involved in the Chelsea Harbour development. He was Managing Director of a property asset management company specialising in the management of property portfolios throughout the UK for privately owned property companies. He is particularly interested in the development of valuation methods and the further use of electronic media in distance education. He is also a tutor at the College of Estate Management, UK.